The red brick apartment building across the street was waking up. Two men walked out wearing unfastened yellow raincoats over their suits. One wore a hat. The other carried an umbrella but didn't unfurl it. They walked away in opposite directions. A car passed by, hissing. The rain fell. 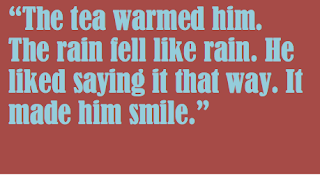 The tea warmed his hands and, when he sipped it, his insides. Tea. Rain. Walking. Things that cannot be described. A phrase from an old song came to mind: "The fundamental things apply, as time goes by..." The rain fell like rain. It was one of the reference points we use to describe other things, he thought. Other things fell like rain. Rain was itself. Like the taste of tea: what is it like? It is the taste of tea. The way she walked when she was young: people liked to describe it as being catlike, but it wasn't. It was a thing in itself. The old man liked things that were themselves. People hurried by, the only animals comfortable walking a long way on two legs. 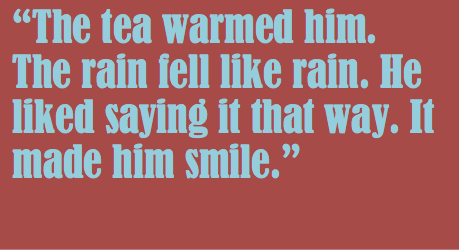 The tea warmed him. The rain fell like rain. He liked saying it that way. It made him smile. It was five years to the day since his wife had died. He had loved her with a quiet feeling that was indescribable. When they were together in the apartment the space felt complete. He looked at the furniture and small decorations surrounding him. All was quiet in the gray light. An old clock on the mantelpiece ticked, the sound blending with the sound of the rain. It had belonged to her grandfather, and once a week he wound it. He had made the winding and dusting of it one of his tasks in the household. The ticking sounded like the repeated thunk of rain in the downspout by the window. Sometimes it fooled him in the night and he thought it was raining when it wasn't. It had been raining the day she died. She had been sitting in the other armchair, reading, had looked up and stared into an unknown distance for a moment, then laid her head gently back and died of a stroke. He had become quietly frantic and called the paramedics, because that was what you did in their world, but he could see there was no help they could give her. She was dead when they arrived. He marveled that he could still love her though she no longer existed. He himself would die someday, and then nothing would matter. But now, in the room softened by the gray rain light, it mattered very much, and he loved her as if she still lived. The sun would die too, and eventually the universe fall back into itself and bloom again with perhaps different rules that did not include love, but in one infinitesimal corner of existence, whatever he was loved whatever she had been. Tomorrow was Saturday, and if it wasn't storming too hard he would put on his long yellow slicker and ride the elderly bicycle he kept out back the ten minutes to the chess club. He had learned the game when she had developed an enthusiasm for it, and had become friends with the one member bad enough at it to play him. The club met at a used bookstore run by a wild-haired old fellow who spoke five languages. They played in the little reading room in the back, where the window showed a view of a drainage ditch, half-visible under a huddle of trees beyond the gravel alley. There was a café on one side and a bar on the other, and he and his chess friend ended up in one or the other after playing their usual three games. He wished she could know he still played chess, and dedicated every victory to her. ...The neighbor's cat walked across the wet garden, stepping fastidiously around the puddles, then made a soft leap into the shelter of the porch. The flowers lining the walkway to the gate nodded when raindrops tapped them, and a man with a broken umbrella walked by, holding a square of cardboard over his head. The old man thought it was appropriate that she had died on a rainy day. She had always felt a child's delight in the rain. He loved it too, but not in a splash-in-the-puddles way. He loved the way it tied the sky and earth together. He loved the rhythm of its drops, the way it fell, the gray light. Things that were themselves. Fundamental things. The way rain fell like rain. Very gentle, yet poignant and bittersweet. Raining cats and dogs? Raining ropes? After reading this, “Rain falls like rain” seems to be the best way to describe it. Very beautiful piece. Today I'm seeing the California rain differently. I think it is about life: it is what it is. This is a lovely story. Sad yet uplifting and beautiful at the same time. I like the idea that not everything has to be like something else, some things just are what they are. Beautiful imagery. A story that reminds us to take pleasure in simple things that we often overlook. I loved the gentleness and the acceptance of life as it is. Like the way the story revolves around the rain and its imagery. Meditative. I can hear the rain fall, like a backdrop to the story. I like the part where he still plays chess. I like the fact the old man likes the rain, it reminds him of childhood... the aspect of time passing, with the ticking of the clock compared to the rain drops falling, is intriguing. Wonderful picture of mindfulness. Love it! Thank you 🙏🏽! Laura T.